The Kolkata Derby drew a massive 64,630-strong crowd to the Salt Lake Stadium. The ISL may have all the glitz and glamour quotient within it, but it is the I-League that is drawing crowds to the galleries by the thousands. The high-voltage Kolkata Derby between Mohun Bagan and East Bengal saw nearly double the amount of fans attend the match, when compared to the highest attendance recorded in the ISL in 2017, so far. Last night, Mohun Bagan and East Bengal FC reignited their age-old rivalry in the I-League. Bagan triumphed with a 1-0 victory over East Bengal in front of a crowd of around 64,000 spectators. According to some number-crunching, this match surpasses the highest attendance in an ISL match this season. The ISL match in question is Atletico de Kolkata vs Kerala Blasters, the opening match of the ISL season. The maximum capacity of the Salt Lake Stadium, where the match took place, has been reduced to 66,687 after the arena was renovated ahead of the FIFA U17 World Cup, earlier this year. 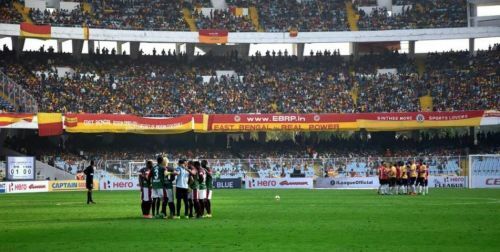 Since Mohun Bagan and East Bengal play their home games in one of the most legendary rivalries in Indian football, it isn't surprising to see such a high turnout. The match was a close affair with neither team giving an inch until the East Bengal defence gave away on the 39th minute. A Sony low delivery found the feet of Eze Kingsley who headed it home to seal the win. Kerala Blasters' opening match against ATK at the Jawaharlal Nehru Stadium in Kochi saw an attendance of 37,463 spectators. Meanwhile, the Kolkata Derby registered almost double that attendance, at 64,630. What is an absolute travesty though, is that the All India Football Federation (AIFF) plans to make ISL the top tier league in the coming seasons, while the I-League is set to be relegated to the second division int he country. Also, there is the possibility of an ISL and I-League merger to think about. Despite multiple talks by concerned parties, no breakthrough has yet been achieved. Some teams have even called for a unified league. Now that the I-League has set the bar that high, it is up to the ISL to attract similar strength crowds to watch their matches. It also must be noted that the I-League cannot be treated like a second-tier league if they are drawing in the masses. This battle for popularity is set to continue between the ISL and the I-League, but at this moment, the ISL seems to be overpowering its competitor on the back of financial strength.